The object of the game is simple enough. The orcs burst through a door at one side of the map and you must stop them from reaching the rift at the other side. As you progress you are awarded new toys in the form of traps or weapons to use against the unrelenting waves of monsters. You are also graded on your performance in each fortress with up to 5 skulls. These skulls can then be used to purchase permanent upgrades to the various traps and weapons you have already unlocked. Further on you are rewarded with help from the Weavers, group of sorceresses who will lend you their skills to for a price. 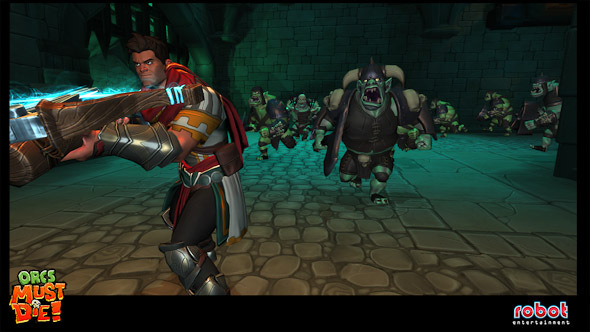 Action packed – Orcs Must Die! may have a sweet tower defense core but it is surrounded by full on third person action goodness. You might think once you kit your fortress out that you can sit back with a cup of cocoa and enjoy the mess that ensues but think again. The game ensures that you take an active part in killing those orcs. 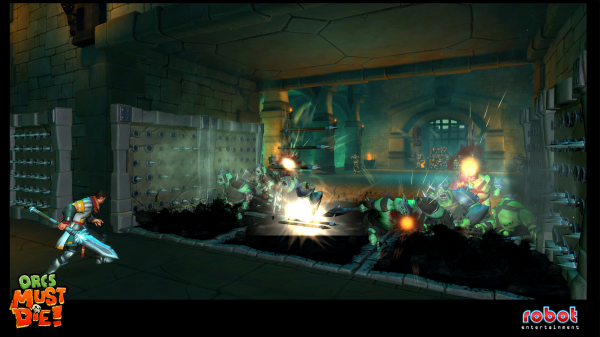 There are never enough coins for you to completely fill the room in traps or guardians, and some of those pesky orcs can jump or fly over well set traps. In addition, there are certain beasts that ignore the rift and actually hunt you and your guardians down, so armed with a crossbow, sword or one of the many spells to choose from you must get down and dirty racking up those head shots and fighting man to orc. This fast paced nature of the game also means those hours really fly by and gives you that “just one more round” addiction we gamers know all about. Variety – “Can you ever have too many traps?” the game asks. We’re thinking no and the more you unlock the more choices you face as you can only take a set number into each level with you. There is no single correct method to beat a level. One player may fill the map with Guardian Archers while another prefers to load the place with spike traps. The game really allows you to set your creativity loose and experiment with what is on offer and it’s really rewarding finding new ways for orcs to die. 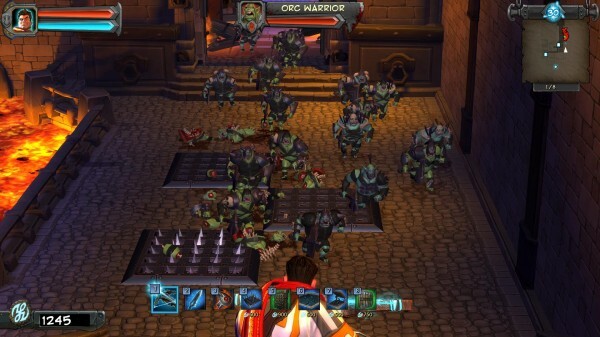 Replay Value – When you start out on Orcs Must Die! you only have a limited variety of traps. As you progress through the game however you unlock one new trap or Weaver with each new fortress. These are obviously needed to help you continue on as the difficulty increases; however, you don’t need to immediately move on to the next level. Fun is to be had by retracing your steps to those early levels armed with a bucket load of new abilities and cunning plans. Leaderboards are very well implemented and really encourage you keep replaying levels and trying new strategies so see which combos give you the highest scores. Likeability – This game’s got a lot of personality. From the amusingly cruel treatment of orcs to the funny one-liners your War Mage spouts, there are plenty of laugh out loud moments. The graphics are top notch; reminiscent of some of the cooler Disney films of yesteryear. The whole package feels like it’s made by people who want to make sure you are having a good time, and never do you feel like you are being punished. When you fail a level (and you will at some point) it’s not because the game cheated you but because you need to change your strategy this time. If you find traps are not working here or you drop one by mistake in a panic, you can sell them back for full price. A simple but nice touch. Repetitive music – The music has an epic “adventure” feel to it and really fits with the tone of the game. It’s catchy and upbeat enough that if you’re that way inclined you can create your own victory dances to go along with it. It will also haunt your brain and keep you awake at night…more variety please. Lack of a clear tutorial – It may be obvious what most of the traps are designed to do and there is a helpful diagram displayed between levels when you unlock a trap showing its capabilities. However, it might have been nice for those unfamiliar with this type of game to be given a quick tutorial. At the start you are advised to open your spell book but then you’re on your own. It also wasn’t mentioned that you can teleport to the rift by using portals on the wall (very useful) or how exactly to utilize the Weavers and that their abilities only remain unlocked for that particular round. We feel there is a danger players could miss useful tricks because you didn’t figure them out. No multiplayer co-op – While it’s enormous fun killing orcs on your own, there may come a time when you think wouldn’t it be cool if my buddy were here helping out in this level. Well they can’t. And given there is a number of other tower defense games out there that do include this option, the worry is that co-op fans may pass on Orcs Must Die! They’d be losing out though. The quality of the gameplay on Orcs Must Die! is through the roof. This feels like an expensive game and the veteran knowledge brought by Robot Entertainment really shows. The difficulty is high on the later levels but it doesn’t feel frustrating. You can still have fun failing a level and if it gets too much then you can happily switch between the 3 difficulty levels of Apprentice, War Mage and Nightmare (unlocked after completing War Mage) from the map selection screen. As the hours fly, you eventually forget about the lack of multiplayer, but to be fair the excellent leaderboards can make it feel like you really are playing along with your friends. We can’t stress enough how awesome this game is.